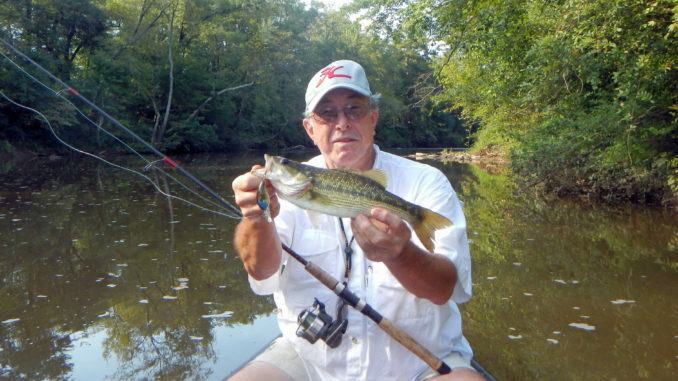 The author with a spotted bass coaxed from a tree top with a shad-patterned crankbait. An assortment of plugs and baits that will handle spots just about anywhere. Kentucky spotted bass, this one caught on a Road Runner with a curlytail grub, are fun to catch, great to eat and beautiful to behold. 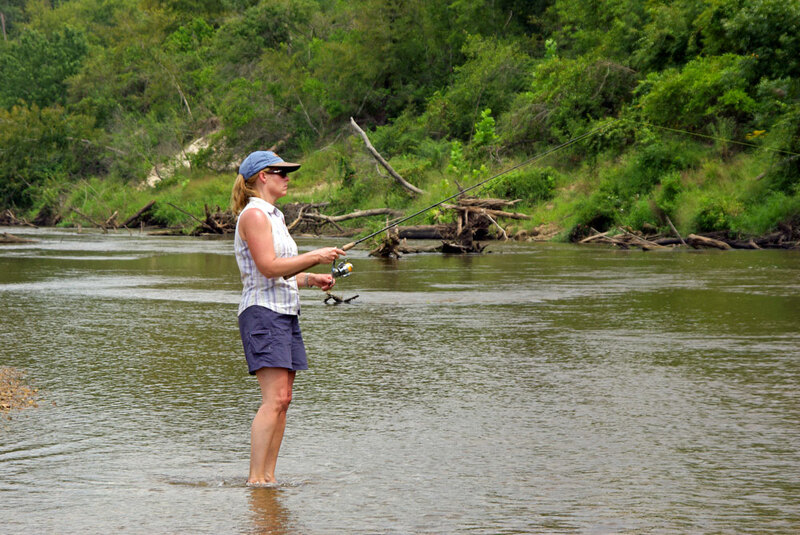 Deanna Simkins of Madison plies the waters below a log jam looking for a spotted bass. 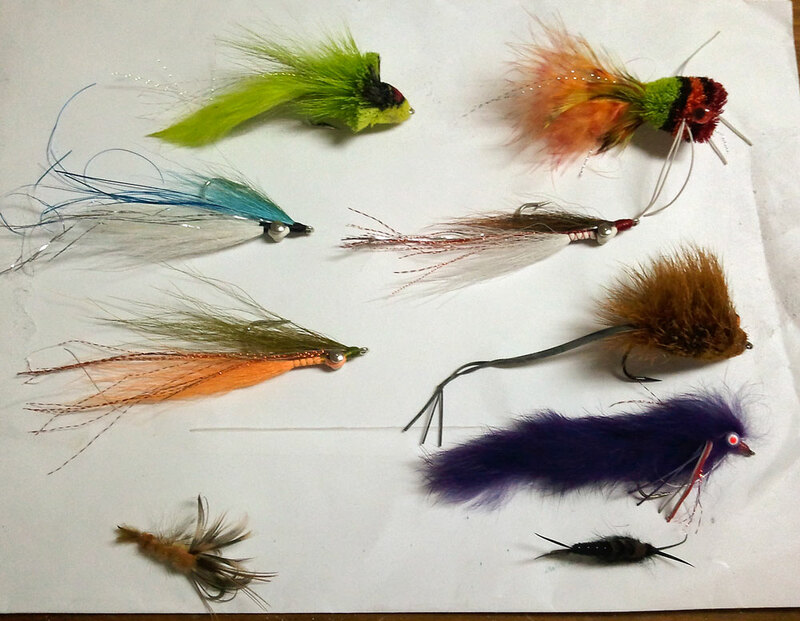 These hand-tied flies by Scott Waters are just a few Mark Golden uses to catch bass and bream on float trips. He grabbed his fishing rod, snipped the line and removed the floating Rapala he had tied on, opting instead for a wacky worm rig on a weighted, weedless hook. He paused in the still waters to let the river and its inhabitants settle after his arrival. Golden cast above the log and allowed the worm to wiggle its way through the fast water and into the calmer pool, using his rod tip to make the lure dance as it fell into the deeper water. Then, he saw what he was hoping to see: a hesitation in the worm’s fall. Golden tightened up and set the hook. The fish ran back under the log. Golden started playing it in the gentle current, which carried him 30 yards downstream before he could boat, unhook, admire and release the fish. It is a spotted bass, a fish that lures fishermen to the Strong River — that, and the peacefulness of a float trip down the river. The Strong River has its origin near the Kalem community in Scott County, but the genuine character of the river becomes most notable when it flows across the shallows at D’Lo, just north of the Simpson County town of Mendenhall. Those shallows are a popular swimming area for locals, featured in the Cohen brothers’ movie O Brother, Where Are Thou? It is at there that the river becomes a navigable waterway for canoeists and lately, even more kayakers. Unless you have been shackled to a prison work gang for the past decade, you know kayaks are the hottest item on the fishing scene. The number of put-in and take-out points along the river between D’Lo and Georgetown is limited due to most of the adjoining land being privately owned. 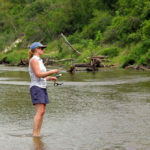 But with a little planning, a float can be enjoyed, and some nice bass and bream can be brought to the boat, along with spotted bass, as feisty as any fish found in small rivers in the state. Wallace said that the section of river from Merit to Pinola is different, much slower and deeper. The next take-out is at Georgetown where the Strong enters the Pearl River just south of Highway 28. 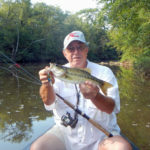 Wallace uses small spinnerbaits for the 1- to 2-pound spotted bass he catches on the upper Strong. His go-to lure is an 1/8-ounce black/green Beetle Spin on ultralight tackle or a 3/8- ounce version of the same bait with a heavier rod. Wallace, who lives on the river in Simpson County, also wants readers to understand that the Strong River may seem sleepy and calm in its normal state, but it can quickly become perilous and very powerful. His father perished while the river was experiencing a sudden rise. While the spotted bass is a river- and stream-dwelling fish, it is also found in many other lakes statewide. Young spots feed on aquatic insects but move up to crustaceans such as crawfish and smaller fishes as they grow. Adults have diets much like large-mouths and will feed on shad and small sunfish. 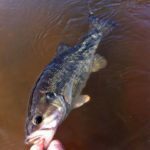 Fishermen on big lakes with good shad populations targeting largemouth bass often catch spotted bass. Lake spots are often larger in size because of the abundant food supply. 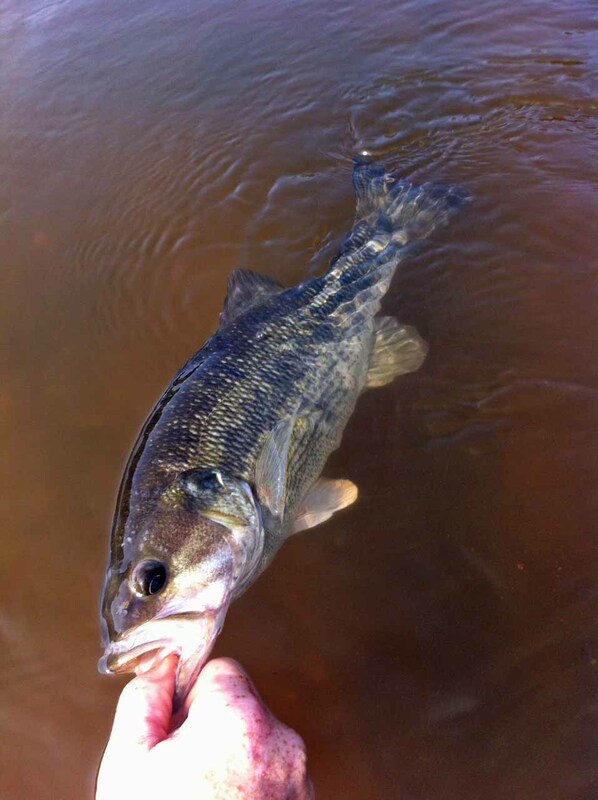 Holman said recent studies have discovered several sub-species of spotted bass with varying characteristics. The spots in the Strong River are like those in the Pearl River, which is no surprise since the rivers join. Golden, from Taylorsville, is a kayak-bound fly fisherman with a penchant for chasing spots in Mississippi’s small. Where water is swift, he will beach his kayak and wade to within casting distance of a promising section of water. “The fish are facing upstream or toward the current that will bring the food past their lair,” Golden said. 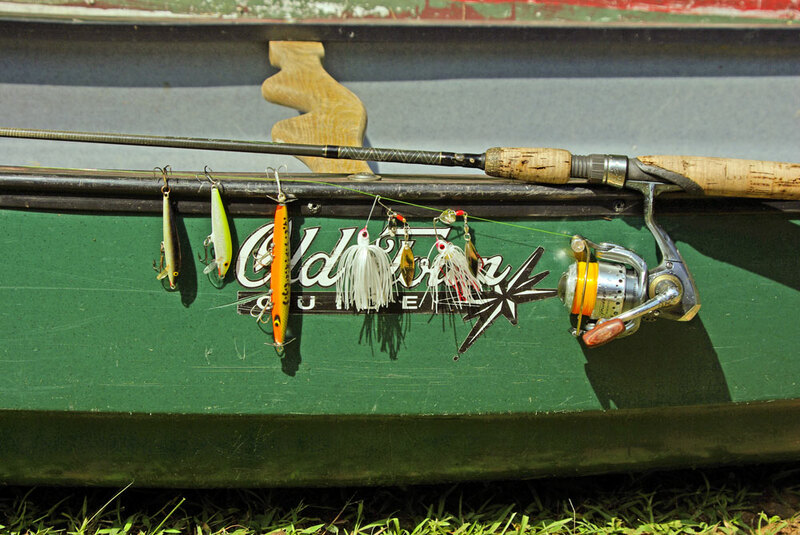 “My go-to fly is a Muddler Minnow with a few red threads in the tail. 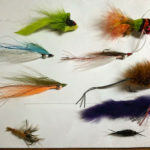 The bigger fly and bigger hook are more apt to hold a bass than smaller popping bugs, which are constantly getting hammered by bream. 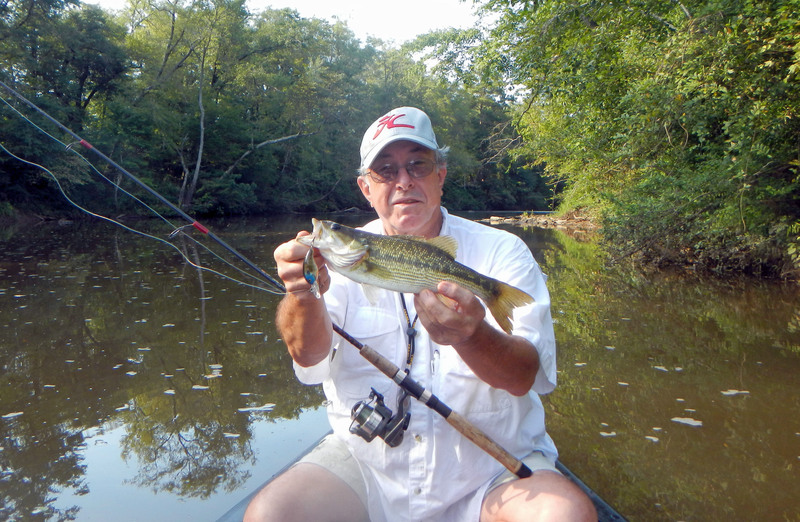 In the fall, bass bugs will catch spots, but the slow sinker just seems to catch more. 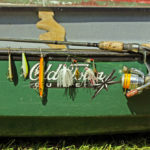 Golden carries three rods on each float trip. “One is a spinning reel spooled with 10-pound fluorocarbon, on a 6-foot, medium-action rod. This is a bit of overkill for smaller bass but just the ticket for a heavier largemouth should you encounter one. Bowfin or grinnel are common where the river gets wide and slow. Golden doesn’t take expensive lures to the streams. 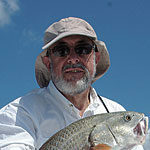 Golden said that the spots he chases are most always in clear water, and that the fish are easily spooked by careless anglers and approaching floaters in kayaks and inner tubes. There are alligators on the river, but Golden said they have always shied away from his watercraft. That’s not to say they may not be curious and get close to investigate. Enough people camp on the sandbars that the gators are bound to associate the smell of food with humans.